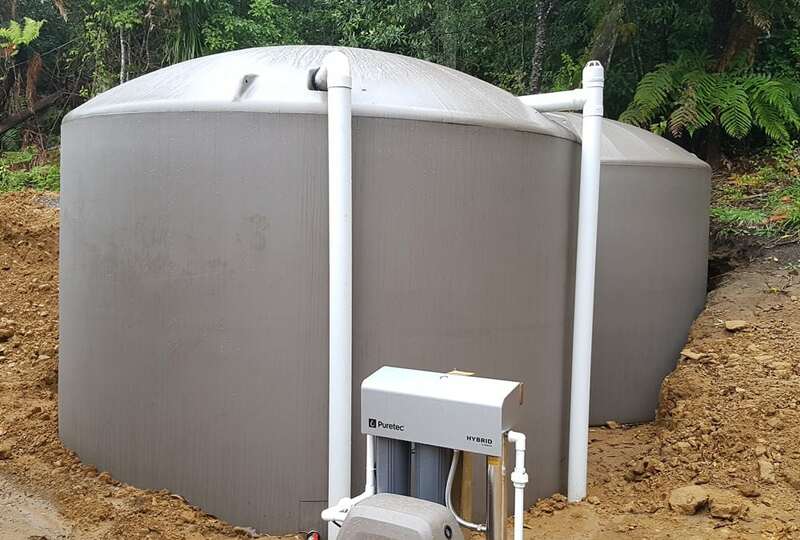 A recently completed build is an example of getting everything you need to live rural from Devan Tanks starting at the Water Tanks and finishing at the wastewater system. When living rural you have a real reliance on the simple basics in life such as fresh safe water and the ability to dispose of your wastewater easily and in an environmentally friendly manor. The new build is deep in bush and is secluded, quiet and best of all hard to find. The complete installation of rain water collection through to wastewater disposal was handled by one of Devan’s many installers. The job consisted of a large shopping list that was all delivered seamlessly by one of Devan’s drivers and delivery trucks. The solution included: 2 x 25,000L Water tanks, Grundfos Pump, Puretec UV filtration system, matching pump cover and an Integra S-15 wastewater treatment system that process the household wastewater and then distributes the high quality treated effluent onto native bush. With the selection of 2 x 25,000L water tanks, the 220m2 roof area and the annual rainfall the is plenty of catchment and storage capacity to get them through the summer without reliance on water trucks. If you have an idea of what you require you can use the build a quote function to work out the cost for your next project.